I made Ocean Voices by building a bowl-like shape that was vertical and had a rather bold diagonal fold in a part of its body. It wasn’t long before I decided that the vertical structure I made was quite boring, so I sliced into it in diagonal verticals with a Saws-All, stuffing those crevices with shims. This enabled me to shift those surface planes so that some were higher or lower than their neighbor. The whole structure then wanted to lie down horizontally and I had it in my mind that the front (head portion) would touch the ground as well as the back with the middle of the body struggling to lift itself up off the ground. I must have made seven different versions of the head or the front portion until I found one that worked. The small patterned appendages that seemed to start at the tip of the head and go up through the front portion of the piece are consequential as well as the shims that I trimmed making some body long finlike structures that are important to the implied movement of the piece. 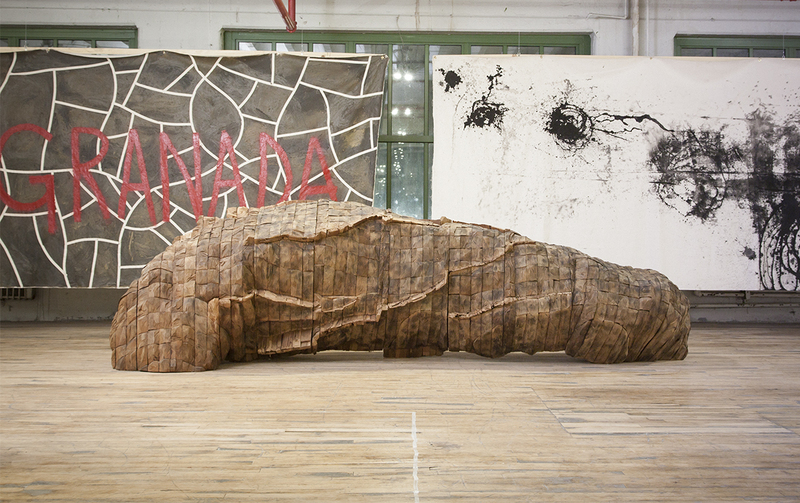 Ursula von Rydingsvard, “Ocean Voices,” 2011-12. Cedar, graphite, 53 x 185 x 67″. Courtesy of the artist and Galerie Lelong. Photo by Rachel Styer. The behemoth thing was like a prehistoric invertebrate sheathed in rhinoceros skin ushering visitors into the exhibition. Confronted with this unknown creature pregnant with secrets, we can’t come to terms with the form; our only recourse seems to be to draw parallels to those things that exist in the extra-human realm. It repels us as any giant slug might but its body is prone, docile, with its head-parts burrowed into the floor. The thing is unable to retreat because either its bloated thorax or the crests of scales (the “fins” as von Rydignsvard has described them) that line the body impede its escape. We can empathize. The title of the works suggests sound. Alone in a room with it, one might perceive a wheezy exhalation or a fleshy quiver escaping from its gills, a consternated sigh. Perhaps we hear a groan, or the sickly slurp of a mollusk’s body moving over wet mud. When we think of this work in process we might imagine the clamor of a stack of cedar shims tumbling off of a workbench, the cacophony of power tools wailing, dry sanding noises. The manifold associations and connections that this form provokes are the “voices” that the title alludes to. Does von Rydingsvard offer us any insight into our own environment with this work? Can our encounter with it jar us into a new kind of relation to Nature? I suspect that Ocean Voices might provoke a wildly divergent set of reactions from different observers. Some may think of a docile manatee. Others might be repelled by the baser connections that Ocean Voices suggests. For me, the work is a somber reminder of the infinite mysteries that remain hidden in the dark corners of the earth. Ocean Voices is on the one hand wholly “natural,” as if it were lifted straight out of the earth, it appears estranged from its original place, in its isolation in the gallery. But on the other hand, when we encounter it, we can sense the labor and the intimacy that von Rydingsvard has with her materials. It is through our identification with the material (cedar, graphite) and the sculptor’s hand that we are made aware of our own creaturely natures.